Much has been made of the slower property market over the last fiscal year, with many drawing parallels to the previous property crash in 2008, which saw a reduction in construction activity and a number of estate agents having to close up shop. However, the reality is far more positive than property buyers, sellers and investors have been led to believe. Indeed, the property market is subdued but remains stable, with the number of transfers registered in the Cape Town, Johannesburg and Pretoria Deeds Offices (the three largest of the ten South African Deeds Registries) supporting this. 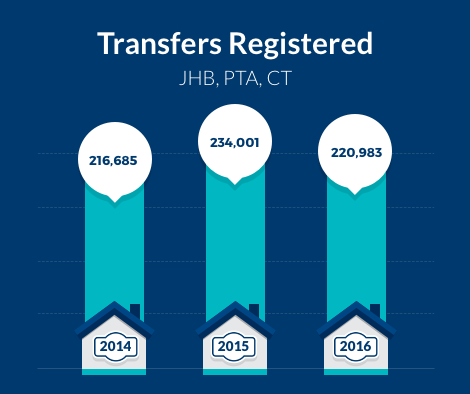 Taking a closer look at the Deeds Office statistics, it is clear to see that while the transfers registered in the Deeds Office took a dip from the 2015 high, they have exceeded the numbers reached in 2014. *Note: Numbers listed are for transfers registered (i.e. not bonds) in the specified year and do not relate to the date of the sale being concluded. 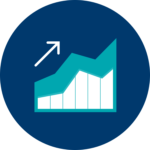 These numbers show a decrease in volumes from 2015 by 5.5%, but an increase of 1% from 2014. This is significant as it reflects the overall, and long-term stability of the South African property market, largely overlooked recently by commentators favouring a more dramatic perspective. Taking into consideration the long-term nature of property investments, the outlook for the property market is indeed positive, and promises continued opportunity for individuals growing personal wealth and businesses achieving positive returns on their property investments.